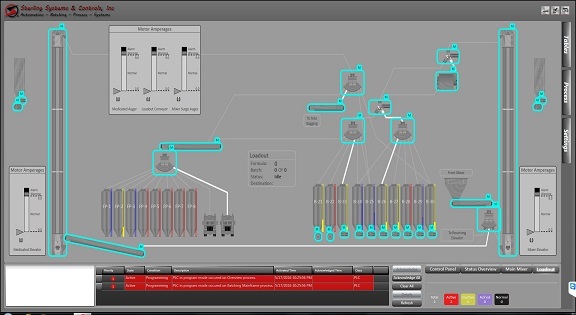 Sterling Systems & Controls offers its automation application module for the loadout of feed materials in feed mills, pet food manufacturing facilities, or for use in other agricultural and industrial applications. The system ensures the transport of the correct product to the desired location, quickly and efficiently, with high accuracy. With the ability to custom fill a truck with multiple orders, the loadout system identifies the load needing to go into the truck trailer and then fills it with the correct material based on the order. From beginning to end, the system validates that all product is loaded into the correct truck, into the correct compartment, and delivered to the correct customer. Custom-designed loadout software application meets exact requirements and ensures feed delivery integrity and validation. High accuracy and performance, data management, report generation and exporting, and simple menu driven screens are easy to use and understand.